More than a thousand Santas hit the streets in Kosovo's capital Sunday to help out their neighbors. It was the third year of an increasingly popular holiday-themed race in snowy Pristina benefitting local families. PRISTINA, Kosovo -- More than a thousand Santas hit the streets in Kosovo's capital Sunday to help out their neighbors. It was the third year of an increasingly popular holiday-themed fun run in snowy Pristina benefitting local families in need ahead of the Christmas holiday. Many of the runners donned red hats and jackets like those worn by Santa, with some even sporting long, white beards. Event organizer Jusuf Islami told the Associated Press that the race has grown in size each year, adding that the money raised this year was enough to support 500 families. Islami described the event as a "humanitarian mini-marathon." As Santas young and old crossed the finish line, many cheered as Islami, dressed as Santa Claus, proposed to his girlfriend. 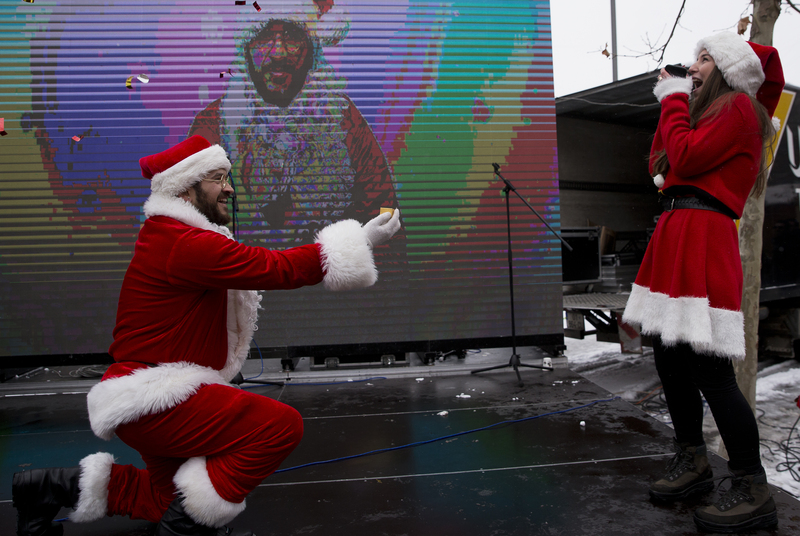 Jusuf Islami proposes to his partner Hana during the 3rd Santa Claus run in Kosovo's capital, Pristina, on Sunday, Dec. 16, 2018.